MIDiA has just published its annual predictions report. Here are a few highlights. Privacy as a product: Apple has set out its stall as the defender of consumer privacy as a counter weight to Facebook and Google, whose businesses depend upon selling their consumers’ data to advertisers. The Cambridge Analytica scandal was the start rather than the end. Companies that can – i.e. those that do not depend upon ad revenue – will start to position user privacy as a product differentiator. Green as a product: Alphabet could potentially position around environmental issues as it does not depend as centrally on physical distribution or hardware manufacture for its revenue. For all of Apple’s genuinely good green intentions, it fundamentally makes products that require lots of energy to produce, uses often scarce and toxic materials and consumes a lot of energy in everyday use. Meanwhile, Amazon uses excessive packaging and single delivery infrastructure, creating a large carbon footprint. So, we could see fault lines emerge with Alphabet and Facebook positioning around the environment as a counter to Apple and potentially Amazon positioning around privacy. The politicisation of brands: Nike’s Colin Kaepernick advert might have been down to cold calculation of its customer base as much as ideology, but what it illustrated was that in today’s increasingly bipartisan world, not taking a position is in itself taking a position. Expect 2019 to see more brands take the step to align themselves with issues that resonate with their user bases. The validation of collective experience: The second decade of the millennium has seen the growing success of mobile-centric experiences across social, music, video, games and more. But this has inherently created a world of siloed, personal experiences, of which being locked away in VR headsets was but a natural conclusion. The continued success of live music alongside the rise of esports, pop-up events and meet ups hints at the emotional vacuum that digital experiences can create. Expect 2019 to see the rise of both offline and digital events (e.g. live streaming) that explicitly look to connect people in shared experiences, and to give them the validation of the collective experience – the knowledge that what they experienced truly was something special but equally fleeting. Tech major content portfolios: All of the tech majors have been building their content portfolios, each with a different focus. 2019 will be another year of content revenue growth for all four tech majors, but Apple may be the first to take the next step and start productising multi-content subscriptions, even if it starts doing so in baby steps by making Apple original TV shows available as part of an Apple Music subscription. Rights disruption: Across all content genres, 2019 will see digital-first companies stretch the boundaries and challenge accepted wisdoms. Whether that be Spotify signing music artists, DAZN securing top tier sports rights, or Facebook acquiring a TV network. These are all very different moves, but they reflect a changing of the guard, with technology companies being able to bring global reach and big budgets to the negotiating table. Expect also more transparency, better reporting and more agile business terms. GDPR sacrificial lamb: In 2018 companies thought they got their houses in order for GDPR compliance. Most consumers certainly thought they had, given how many opt in notifications they received in their inboxes. However, many companies skirted around the edges of compliance, especially US companies. In 2019 we will see European authorities start to police compliance more sternly. Expect some big sacrificial lambs in 2019 to scare the rest of the marketplace into compliance. They will also aim to educate the world that this is not a European problem, so expect some of those companies to be American. Watch your back Facebook. Big data backlash: By now companies have more data, data scientists and data dashboards than they know what to do with. 2019 will see some of the smarter companies start to realise that just because you can track it does not mean that you need to track it. Many companies are beginning to experience data paralysis, confounded by the deluge of data, with management teams unable to decipher the relevance of the analysis put together by their data scientists and BI teams. A simplified, streamlined approach is needed and 2019 will see the start of this. Voice, AI, machine learning (and maybe AR) all continue on their path: These otherwise disparate trends are pulled together for the simple reason that they are long-term structural trends that helped shape the digital economy in 2018 and will continue to do so in 2019. Rather than try to over simplify into some single event, we instead back each of these four trends to continue to accelerate in importance and influence. For music, video, media, brands and games specific predictions, MIDiA clients can check out our report here. If you are not a client and would like to get access to the report please email arevinth@midiaresearch.com. We are at critical juncture in the evolution of digital content. Digital consumption of content, spurred by accelerating adoption of smartphones and tablets, is crashing towards the mainstream, while traditional revenues and business models continue to buckle under the strain. Legal and business disputes between Amazon and book publishers, and Google and independent record labels are small but crucial parts of this process. This period of disruptive flux is giving way to a new era of content distribution in which a few large technology companies are assuming the role of distributor, retailer, channel and playback device as one single package. The emerging new world order is defined by concentration of power, reduction of competition and the subservience of traditional media companies. The 2000’s witnessed the ascendancy of digital innovators, now we are arriving at a new chapter: the Innovator Hegemony, the era of the all powerful, unregulated technology superpower. We are mid way through the shift from the distribution era of selling units of stuff, be they newspapers, CDs, packaged games, books or DVDs, to the consumption era where consumers increasingly value access over ownership. This shift manifest itself as a meltdown of the traditional media industries and associated retailing channels. Out of the ruins of these crumbling nation states Amazon, Apple and Google have started to construct sprawling digital content empires. Until relatively recently it looked like Apple was the only company that had learned how to make digital content works as a business, albeit as a loss leading one. But during the last year the market has inevitably buckled under the pressure of Amazon’s willingness to give away access to content as bait for free shipping and Google’s endless appetite for giving content away for consumer data. Amazon and Google realized they were never going to win if they played the game by the Apple’s rules, which had been transplanted from the analogue age, namely charging for ownership of content. Instead they have opted for the digital zeitgeist: free, or at least feels like free. It is beginning to look like iTunes was a historical anomaly, an isolated outpost for distribution era practices in the digital realm. What Amazon and Google have done is pick up the baton Napster dropped in the early 2000’s and they have run with it. There is little reason media companies would want to cede so much power and pay the inexorable price of devaluing digital content to the price point of zero. They do so because they allowed their partners to get too powerful. This is the Innovator Hegemony. Apple, Google and Amazon all used content as a stepping stone towards achieving global scale, scale that once gained they used to swap the balance of power. Labels, publishers, authors and artists suddenly found themselves beholden to companies they had helped succeed and that success now used against them. But there is an issue of even greater significance at play: the inability of market regulation to appropriately counter the increasingly monopolistic behaviours of the big technology companies’ content moves. Anti-trust and competition legislation neuters media companies but leaves technology companies to operate with near impunity. Dating back to the analogue era when media companies were all powerful, anti-trust legislation was designed to prevent media companies colluding and entering into monopolistic behaviour. But now that technology companies own the platform control points that media companies depend upon in the digital realm, anti-trust and competition legislation has the unintended consequence of consolidating the power of the technology monopolies by stymying media companies. The three big technology companies have a greater concentration of influence and market share in digital content than any single media company did in the analogue era. Amazon, Apple and Google have become a single, effective monopoly in each of their respective marketplaces. Thus anti-trust legislation currently has the unintended consequence of reinforcing market concentration. Matters are not helped by the fact that media companies have become something of a busted flush at the legislative level, having over reached with copyright and anti-piracy lobbying efforts. The dramatic collapse of SOPA and the failure of Hadopi illustrate how media companies have lost legislators’ hearts and minds. After years of media industry ascendency the lobbying balance has swung towards the technology companies who are winning over key influencers such as the European Commissioner Neelie Kroes. Right now Amazon and Google are testing the boundaries, seeing what they can get away with before they are reined in. Amazon is unashamedly abusing its platform to hurt sales of book publishers such as Hachette and Bonnier, while Google is equally brazenly threatening to turn off monetization of music videos of labels that will not sign its overweening YouTube contract. Interestingly both Amazon and Google appear to be testing just how forceful they can be with the independent ends of the media business spectrum. These actions show us how vertically integrated platforms have a tendency to become internal de facto monopolies with effectively limitless internal power. Power that corrupts, and that ultimately turns the ideologies of these once idealistic disruptive start ups into police states where dissension is no more tolerated than it is in North Korea. It is time for media companies and policy makers to decide whether they are brave enough to stand up to the Innovator Hegemony. Every content company still has the nuclear option of pulling content from the services but few will ever dare to do so – the German YouTube stand off a rare exception. And therein lies the problem, media companies already feel they cannot exist without the big technology partners and the tech companies know it. Without appropriate macro checks and balances the outcome will always be the timeless, asymmetrical roles of bully and bullied. Two years ago I said that the nightmare piracy scenario for the media industries would be when the pirates gave up trying to fight enforcement and turned their attentions to build great user experiences. Now with the arrival of Popcorn Time that scenario has come to pass. However bad piracy might have been for media companies, it is just about to get a whole lot worse. This is the new era of Experience-First Piracy. Popcorn Time is an open source interface that sits on the top of pirated video content on torrents. Instead of downloading the video Popcorn Time streams them to the end user, with titles selected from a neat Netflix-like interface. 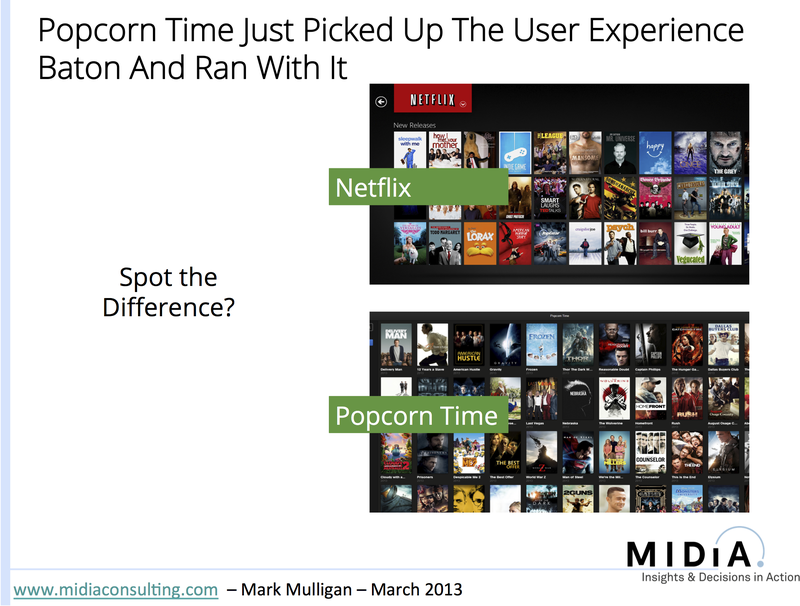 In fact one might argue a ‘Netflix clone’ interface (see figure) but with new releases that Netflix does not even have. On top of all this Popcorn Time is open source, with installer and project files all hosted on developer collaboration site GitHub, and with the app built on a series of APIs. With multiple development forks already this is an entirely new beast in the piracy arena. Forget whack-a-mole, this is potentially a drug-resistant, mutating contagion. Until now, piracy was largely the domain of youngish tech savvy males (69% male, 50% under 35). Popcorn Time and the inevitable coming wave of new Experience-First piracy apps will give piracy truly mainstream appeal. It looks and feels just like the real thing, only for free and with even better content. What’s not to like? Worse still – for media companies, not consumers – these sites might – even have a legal defense as they do not actually host any of the files. The emphasis there is on the ‘might’ as it is an argument that ultimately the Pirate Bay was not able to defend in court. Windowing: Netflix can only dream of having the content Popcorn Time has, just as early licensed music services could only dream of having the catalogue Napster had in 1999/2000. The movie studios need to learn that lesson fast, and treat Netflix and Amazon Prime etc. as tier 1 release window partners. As soon as a release is ready for its first post-theatre window it should go straight onto the paid video services. BlueRay and DVD are fading yesteryear technology, the media industries’ most engaged and valuable audiences are online and using online services. It is time to treat them as first class customers, not second class ones. User Experience: Before Experience-First Piracy, the retort to media companies was that all they needed to do in order to stay ahead of piracy was to create more compelling alternatives. Now the ante has been well and truly upped. There will never ever be the user experience gulf again. That time has gone. This means licensed services have to be continually pushing the user experience envelope, using their capital to hire the very best designers and developers. Which means that content companies need to saddle them with as little up front rights acquisition debt as possible, freeing them up to spend big on development and design. Pricing: The harsh reality of the internet economy is that when something is widely available for free you have to make your paid-for product even cheaper than it was intended to be. For Netflix and Spotify et al, that means getting below $5 a month. Ironically this happens at just the time that Amazon increases its pricing for Prime and Netflix is considering increasing its pricing in order to cover higher rights costs. Media companies have a crucial decision to make: do they want to get more revenue per user out of a user base that will quickly lose share to Experience-First Piracy, or instead do they want to take a near-term revenue hit in order to shore up their digital service partners’ longer term future? The fact that piracy has spent so long locked in a user experience quagmire is testament to the media industries’ counter measures: pirate sites were just too busy figuring out how to evade enforcement to focus on user experience. But now that era has come to a shuddering halt. It is difficult to over state the dramatic effect Experience-First Piracy will have on the paid content landscape unless media companies do everything within their powers to help the nascent licensed services respond in kind. The smart companies realized long ago that content is not the product, experience is. Unfortunately the pirate’s just figured this out too. YouTube has long been the digital music anomaly: hugely successful, almost free of criticism but with a pitifully small pay-per-stream rate (below half that of Spotify, who does get criticism, and some). YouTube is now on the verge of launching a subscription product and this will hopefully go some way of addressing the fact it has made the marketing journey the consumption destination. But the music industry should keep its aspirations in check, not just about the potential impact of the service, but also – and perhaps most importantly – because of YouTube’s intent. Google is a rights frenemy. Rights frenemies strike a careful balance between maintaining good relations with rights holders on one side of their business but testing the limits on the other side. They pursue a do first, ask forgiveness later strategy. Thus all the while Google is launching two music subscription services (Google Play Music All Access and the forthcoming YouTube offering) it is also lobbying for copyright reform and posting a link to chillingeffects.org for every successful copyright takedown. In other words Google talks the talk but only reluctantly so and it does the absolute minimum of walking the walk. Nowhere is this approach more apparent in YouTube and the presence of user uploaded ‘full albums’. A coherent argument can be made that 383 million views of Miley Cyrus’s ‘Wrecking Ball’ Vevo video delivered clear benefits to the artist and her team (both though direct Vevo advertising and the vast exposure). 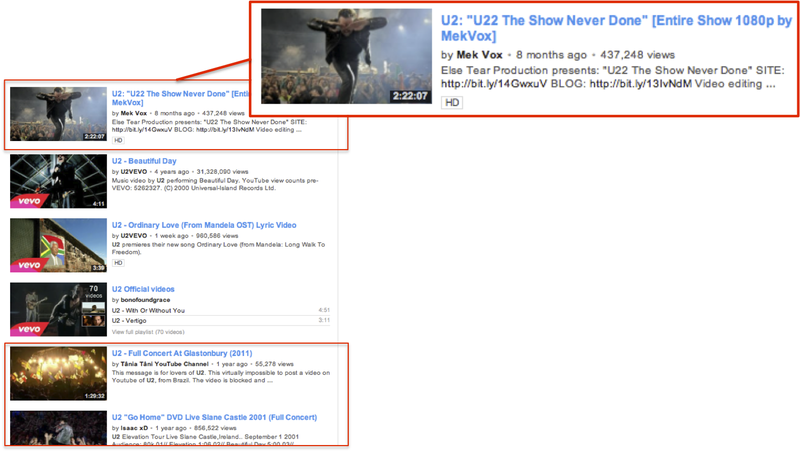 Full length albums ripped into YouTube by users have no such benefit. In fact labels in the main do what they can to remove them using YouTube’s takedown process. If Google was a rights ally rather than a rights frenemy it wouldn’t solely wait to be told to take stuff down, at least for the really obvious and high profile stuff, but it doesn’t. 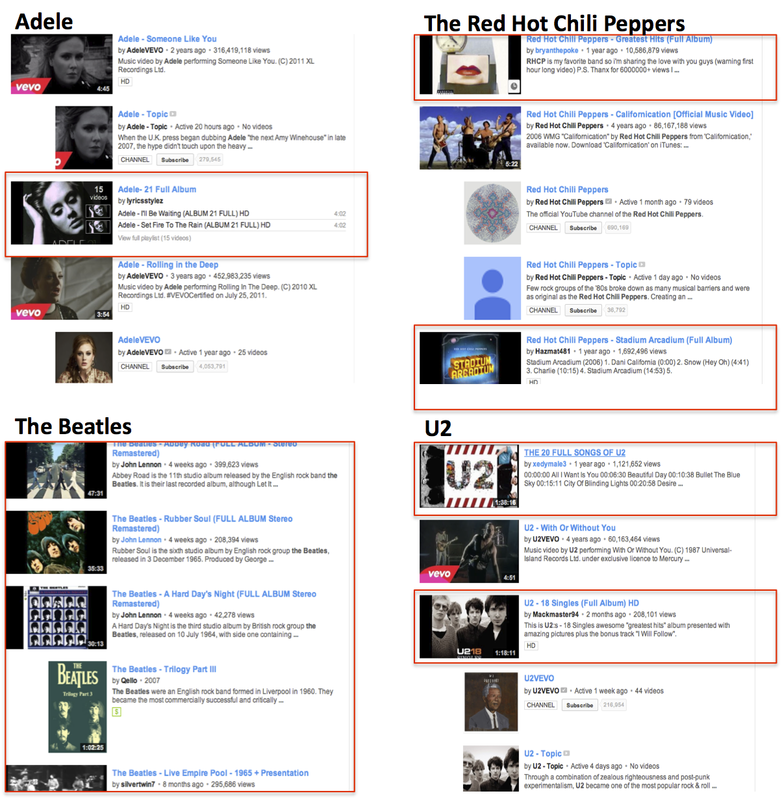 Take a look at these top search results for Adele, U2, the Red Hot Chili Peppers and the Beatles (see figure 1). The full album results are high lighted in red, many of which have hundreds of thousands of views each, in the case of Adele’s ‘21’ it is more than 1 million, and some have been live for more than a year. In the case of the Beatles all of the top results are full albums. I doubt that the Beatles spent the best part of a decade not licensing to iTunes in order to suddenly throw it all straight up on YouTube. There are also endless ripped live DVDs and recorded TV broadcasts of live concerts (see figure 2). It’s pretty hard to see why somebody would want to buy a live DVD of a U2 show when they can get the entire show in 1080p HD on YouTube. And of course because it is a continual 2 hours and 22 minutes of video the viewing experience will be virtually ad free, save for a 30 second pre-roll and the odd pop up which can easily be clicked off. The only winner here in business terms is YouTube. Not all the blame can be laid at Google’s feet though: these examples were found immediately, with no effort, so it is inconceivable that someone somewhere in each of the respective labels doesn’t also know about this. Thus someone has taken the decision in some of these instances to take the benefit of the ‘exposure’ in return for cannibalizing sales of the exact same music the exposure is supposed to drive sales of. It is this conflicted view of YouTube (i.e. ‘we couldn’t sell as much music without it even though we lose sales because of it) that needs to be fixed. Google can hardly be blamed for having a schizophrenic approach to the music industry if the industry does exactly the same back. But relationship issues notwithstanding, full albums need to disappear from YouTube right now. They need to do so if for no other reason than to level the playing field for those music services that pay back at higher rates to rights owners and that actually try to get consumers to pay for music. Labels and Google, bang your respective heads together! 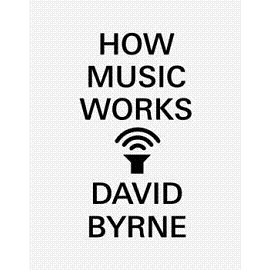 I’m excited to announce that next week I will be with Talking Head David Byrne and pioneering DJ Dave Haslam, discussing Byrne’s new book ‘How Music Works’ and many of the issues covered in it, including how digital consumption patterns are fundamentally changing both how music is listened to and how it is made. It is going to be a great event and a fantastic opportunity to hear David Byrne talk about his views on making and performing music, the evolution of the music business and changes in music culture. And if you haven’t read ‘How Music Works’ yet I recommend you go out and get yourself a copy, it’s a great read. The full details of the event and ticketing can be found here, and a synopsis of the event is copied below. Plug In, Tune Out; Does Music Matter Less In the Current Era? Join Dave Haslam for a special event featuring David Byrne and Mark Mulligan discussing Byrne’s new book, ‘How Music Works’, in which the Talking Heads co-founder explores the joy and the business of making music, and analyses how profoundly music is shaped by its time and place. Byrne and Mulligan will discuss the changes in the consumption and production of music in the digital age. Doors 6.30pm. Event starts 7.30pm prompt (running time approx 90 mins). Waterstones will be providing a bookstall. Pre-signed books of ‘How Music Works’ will be available for sale at the event (there will not be a public book signing). On Sale from Friday 5 October 2012 at 11am (maximum purchase of 4 tickets per customer). Bruce Willis is reported to be considering legal action against Apple to enable him to bequeath his sizable iTunes music collection to his children. Whether there is basis in the story or not it shines an unforgiving light not so much on Apple’s terms and conditions but the role of copyright in consumer music products as a whole. The issue at stake is that iTunes terms and conditions prevent the original purchaser from giving the purchased music to someone else. But this is not something unique to iTunes, it applies to virtually every single piece of music product that you have ever bought (assuming you have bought some at some time or another). And not just to downloads, but also to CDs, vinyl, cassette, MiniDisc and just about any other physical format you care to throw into the mix. With each and every one of those music product formats that you have purchased, all that you actually own is the physical packaging and media, and a license to play the music inside it. You do not own the music. And the licenses come with pretty specific restrictions, often including the number of people that are in the room when you are playing it, though the exact number of people who are allowed to listen to music in your living room is defined by national statute. The restrictions also cover copying, lending and selling. Of course (personal) copying, lending, listening at parties, gifting and buying used albums have all been integral parts of the music experience for decades. People simply enjoyed the music how they wanted to regardless of the restrictions, many of which they simply were not aware of. Take a look at the small print on the back of a CD album – if you still have any – and you’ll see a copyright notice. The exact wording will vary according to the label and the country of origin or sale, but the same underlying principle applies across all of them: you don’t actually own the music on the album, instead you have bought a license to play that music. In the physical era people rarely bumped into these restrictions, but in the digital age labels and other rights owners have the ability to enforce them through technology. So should Bruce Willis really prove to be tilting at iTunes’ windmills, it will be decades of global copyright convention and practice that he will in fact be facing, and any potential judge will be made keenly aware of this. Which raises the stakes in quantum leap proportions and builds a case for the industry to come up with common sense business solutions before the entire music copyright edifice is challenged. Copyright is the critical tool for monetizing content and ensuring creators and originators are fairly compensated. But copyright is at its best when it serves those purposes without placing impractical and unreasonable restrictions on consumers. Paying music fans are becoming an increasingly self-selective group. In the analogue era most music fans were also recorded music buyers. In the digital age music fans often opt out from music purchasing entirely. Thus when analogue-era copyright legacies affect digital music buyers, it is the valuable, opted-in part of the population that is being penalized, not the freeloading opted-out portion. A situation which of course has already happened once before online, with rights owners’ earlier insistence on all downloads being shackled with DRM. The indies, and then EMI and iTunes finally broke the DRM hoodoo and one would hope that a similar outcome could be achieved here. Changing the underlying copyright frameworks and agreements is not going to happen either soon or quickly, but just as DRM was solved with business decisions, so could the issue of transferring ownership of purchased music. Rights owners and digital music retailers could create a framework agreement to permit certain behaviours within specific parameters or could simply agree to turn a blind eye in certain scenarios. It would be copyright suicide to suggest that a music customer could ‘give’ their music to anyone they so choose, because a single digital copy can always be legion. But a ‘fair use’ approach which supports a number of scenarios, such as Willis’ desire to bequeath to his children, would be an eminently workable solution. Copyright should protect rights but not at the expense of penalizing legitimate customers over those who don’t bother to pay at all.